Since 1962 I have been working on the next design. Few days have gone without adding new ideas towards the perfect boat. I am always sure that now I have found it, next days having slept on it there is something that I did not think of or my values have changed or a new invention have been made. I have worked with wood, steel, epoxy, fiberglass, Kevlar aluminum, stainless steel and more. First I made my calculations with a slide rule, and then in the 1970’s came the pocket calculator, now it’s the cad, computer aided design. Friends help to use it. Hopefully I will one day learn myself. When you do something new you always get it wrong the first time. You are a child in a new world. Why, because real life is to complicate to be imagined. Even the combination of a small number of elements gives many possibilities. Six persons can be placed in 720 different ways around a table. With six people one can have a different setting around a table each day for two years. With 24 persons the combinations increase to six times ten to the power of twenty-three. This is remarkable because even if you change settings a thousand times a second you have to continue a thousand times longer than our universe has existed. A boat contains many more elements than twenty-four. That guaranties that there are always new possibilities – and new ways of making mistakes. That is why I spend much time on making mock-ups and why designing the next boat takes longer than building a conventional one with drawings from a yacht designer. But of course it is so much more fun and instructive. Also you get a boat that suits your needs and not one that is designed to make profit for a company. Is this my final design, don’t bet on it, but its surely an big improvement on my previous ones and that was a big improvement on the one before that. 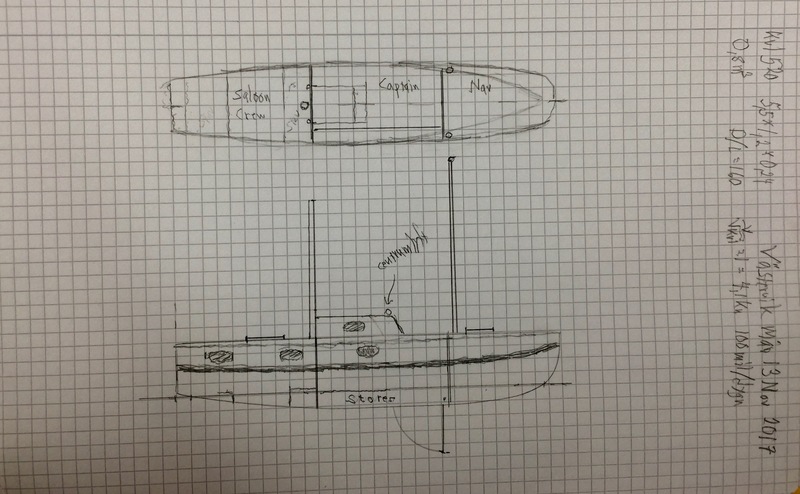 5.6 meter long or 18’ 4’’ she has a beam of 1.4 meter a draft of 27 centimeters and a displacement of 1.2 ton fully loaded. With that load she can be at sea for many months, 500 days will be no problem for one person. She got no engine a sculling oar will be used for harbors and calms. If I get older I may have to add an electrical motor. She has three masts, one at the back and two forward, side by side. Forward there are four mast holders, that way I can place the masts diagonally if the conditions demands that. She has two pivoting bilge boards of quite big radius well forwards. The boards extend a bit above the deck. That way I can position them with my hands. They need no ropes to control them. Also the pivot pin can be reached from the outside of the hull, a very convenient arrangement and it guaranties no leaks. The boat has two waterproof bulkheads, dividing her into three compartments. The forward compartment is 1.7 meters long. 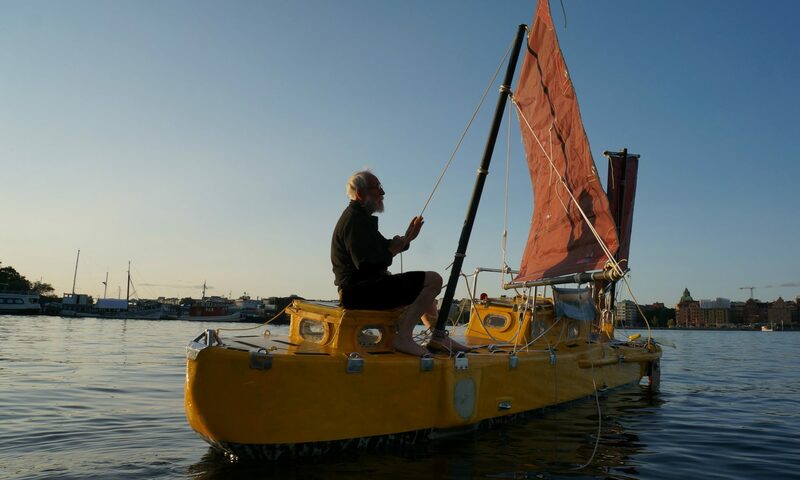 It has a hatch that allows me to handle sails and bilge boards without having to go on deck. 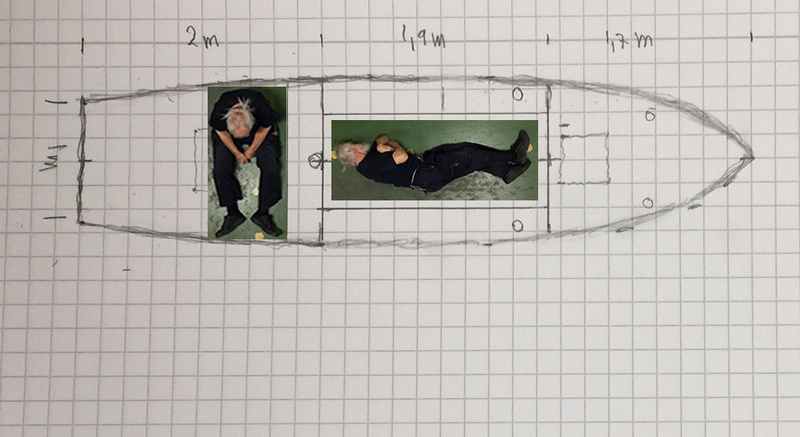 The middle compartment, 1.9 meters long, is Captains cabin. There I will sleep write read and design the next boat. This compartment has a small deckhouse to keep outlook. Below my bunk is storage. The aft compartment is 2.0 meters long. It’s the saloon with an eating-place. Eating is done sitting crosswise, the inside beam of 1.3 meters gives ample room for short people. There is a bunk, should I find a short, practical, thrifty, girl willing to share my voyages. Aft compartment has a deck hatch to handle the aft sail and the sculling oar. No need to go on the deck. The hatch is at deck level making it convenient to reach the water for washing up. With a hatch so low one gets very close to the water. That gives a sense of joy. 30 centimeters one foot closer to the water makes an enormous difference to being at one with nature. Exlex is the prototype for the next design. During her building plenty of things have turned up that I did not think of that has made her heavy and clumsy. These problems are now solved. The voyage to New Zealand will no doubt turn up more problems for me to solve. There certainly is room for much improvement. 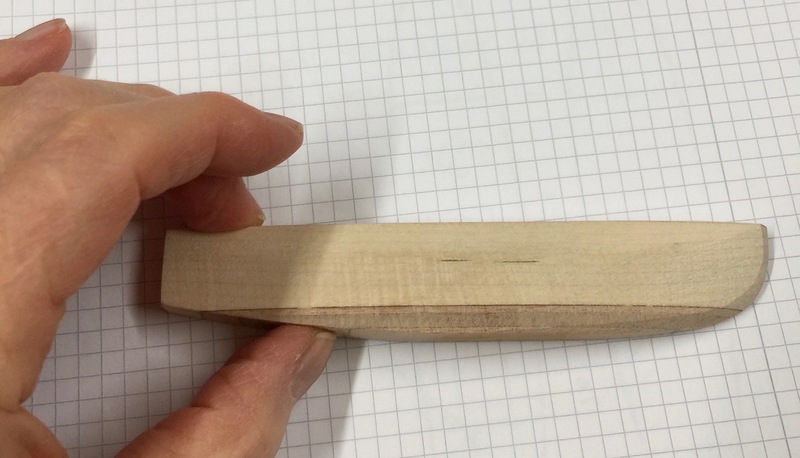 “Next design” is 16 centimeters shorter, but 36 centimeters wider than her prototype. She has more headroom, 90 centimeters. I will increase the sail area a bit.